Française des Jeux's presumptive Tour de France leader, Australia's Bradley McGee, is definitely out of the 2006 Tour. McGee, who finished last year's Tour, dropped out of the 2004 Tour with back and hip problems similar to those that forced him out of this week's Tour of Switzerland and the Giro d'Italia. "Specialists in Paris confirmed Friday the cause of my sciatica is coming from a small hernia that, under the force of riding, is forcing itself on to the nerve and explaining the grief I have been dealing with these past months," McGee said. "It seems likely I will undergo surgery in the near future with the hope to be able to return to racing before season's end. "I feel relieved to have finally located and explained the cause of my difficulties." Française des Jeux's Bradley McGee is doubtful for this year's Tour after withdrawing from the Tour of Switzerland. McGee, who won a stage at last years Tour de Suisse, had to drop out of the 2004 Tour with pain in his back and legs. Looks like it's an inflamed sciatic nerve this time, but again BBC Sport says the causes are somewhat unclear. Bradley McGee thinks he's going to be wearing yellow Saturday night. "With my track experience, the route plays into my hands better than anyone's," McGee told BBC Sport. "I'll be backing myself over anyone, Armstrong included, to be on top come the close on Saturday." Given the course profile over the first few days, it's likely that anyone who gets a gap on the sprinters with the best time-trial skills (Thor Hushovd comes to mind) will hold onto the race lead for a while. Armstrong, meanwhile, described the time trial as "strange". And the American, who this year is bidding for a seventh Tour win, added: "Although it's only 19km long, it's straight into a headwind so it feels more like 25-30km in terms of distance. "It's fairly basic but, sure, we'll be going for it to put a marker down." "We could have three riders in the top 20 come Paris, if all goes well." Turtur calls out Michael Rogers, Cadel Evans, and Brad McGee as the Aussies "capable of high overall placings," and thinks McEwen could pile up some stage wins and compete for the green jersey. The Tour Down Under will also have a car in the Tour de France race caravan this year, promoting the race and South Australia as a tourist destination. Bradley McGee will stick with Fdjeux.com through 2006. McGee is 28, and won a team pursuit gold in Athens. Also signing Tuesday was the son of former Tour winner Stephen Roche, 19-year-old Nicolas Roche, who has a two-year deal with Cofidis. Bradley McGee of Fdjeux.com abandoned during today's stage of the Tour de France. McGee had been having a very good year, and was a favorite to take the prologue, but he's been suffering from back problems since the Tour started, problems he blamed on planting some olive trees at his new home. He's the second Fdjeux.com rider to abandon, after fellow Aussie Nick Gates. Bradley McGee of Fdjeux.com is still hurting from the pelvis injury that left him way off the back in Stage 1. Today, his Fdjeux.com team was caught on the road by Liberty Seguros, who started 5 minutes behind them, and finished last, nearly 2 minutes behind the 20th placed team. "The warm-up and the start of the stage went really good," McGee told AFP. "But after the first 10 to 15kms I began to suffer. The team's rhythm wasn't too fast in general but it began to be too fast for me." Bradley McGee was able to finish the 2nd stage in the field, after a chiropractor was able to straighten out the back problem that kicked McGee off the back yesterday. "Thanks to the work of the chiropractor I was a lot straighter on the bike, that's the important thing but unfortunately I still haven't got a lot of power and so I couldn't help Baden Cooke in the sprint and I was just another number in the main field ... I'm a lot happier now and should be okay to carry on," he said. McGee could be the Tyler Hamilton story of this year's Tour, if he can ride back into the conditioning he showed in the Route du Sud. McGee: "I can't go on suffering like that"
"My back is just cut in half and I can't feel my legs. My feet are numb and I can't get any power out. "I'm going to get it looked at and try and find out more, but I can't go on suffering like that." McGee said his hips are "out of place and are falling in and out of where they are supposed to be, and today they were definitely out. If McGee drops out, the record Aussie contingent, which was slated to be 10, would be down to 7, after Matthew White's accident before the prologue, and Nick Gates finishing outside the control on today's stage. Bradley McGee was the consensus pick to win yesterday's prologue, but finished 4th, blaming stomach trouble that kept him from doing a proper warmup. Today, he's spent a big part of the day off the back, with Mario Cipollini's group of chasers, and race reports have him conferring with his team doctor. At his website, McGee notes he's 2kg lighter than he's ever been. Just yesterday, McGee predicted his weight loss would make him a factor in the GC this year. Update: With about 10 miles (16 km) to ride, McGee has been spit off the back like me on a training ride. Could be the return of McGee's mysterious blood sugar ailment. Australia's Brad McGee of fdjeux.com has had a very strong year, taking the Route du Sud last week and finishing 8th in the Giro, and believes he's developed into a rider who can compete for the GC in the Tour de France. "Going for overall victory next year is the goal, and a very realistic one at that," he told BBC Sport. "I don't know about winning five in a row though. That takes a very special rider." For 2004, he's looking to take the prologue, as he did last year, and is targeting the time trial up Alpe d'Huez. McGee has made some progress battling the blood sugar problems that plagued him during the 2003 Tour. After eating while riding, his body has often produced too much sugar, which in turn causes his blood-glucose level to dramatically drop later on. But he has since hired a dietician and the problem has not once occurred this year. "It's hard enough going up those mountains without that sort of thing happening," said McGee. "When it happens it causes me to lose up to 15 minutes on a stage. I'm just grateful it's not happening anymore." Brad McGee finished in the pack today to take the Route du Sud. McGee took the lead based on a strong time trial, where he beat world TT champion David Millar by 23 seconds. Keep an eye on both McGee and Millar in the Tour de France prologue July 3rd. 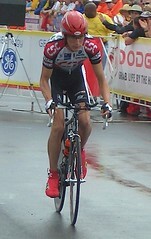 Brad McGee of FDJeux.com won the opening prologue of the Tour of Romandie on Tuesday. Defending Tour of Romandie champion Tyler Hamilton was 5th, riding conservatively on a tight and technical course. McGee won the prologue at the 2003 Tour de France, as well.